Have you always dreamed of owning a charcoal grill, but never thought it was possible because they take up too much space? If so, your dream could become a reality with the Weber Smokey Joe Silver BBQ grill. The Weber Smokey Joe is the charcoal grill equivalent of Yoda. It is only 17 inches tall and the grilling area is only 14.25 inches in diameter, but it is more than capable of cooking any steak, brat, hamburger or hotdog you decide to throw at it. The Smokey Joe also travels well. You will have no problem taking it to the beach, the park, tailgating, camping or basically anywhere the controlled burning of something is allowed. I own a Weber Smokey Joe Silver and frequently use it as a campfire pit. This is where the 17 inch height is critical. With a full size kettle grill you would have a hard time roasting marshmallows while sitting in a lawn chair. You would have to stand up and might be mistaken by alarmed passersby as a vagrant having a barrel fire. The Smokey Joe on the other hand simply appears to be a respectable campfire. The steel legs and the ash catcher ensure that whatever surface you set it on will not be damaged by heat or hot embers falling out the bottom of the grill. The biggest thing to keep in mind is that all of the Weber Smokey Joe’s strengths can easily become weaknesses. The 14.25 inches in diameter grilling area can broil four hamburgers, but anything above four would take some serious strategizing. 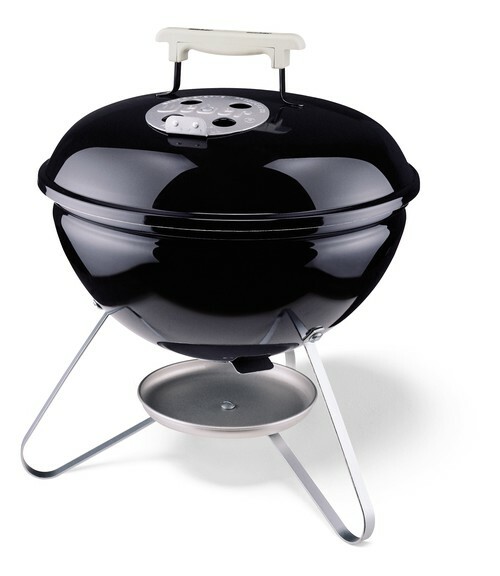 I would guesstimate that the Smokey Joe is capable of barbequing enough food for you and at most two of your friends. Cooking for more than three people is probably pushing it. The fancy tricks you can try with the larger kettle grills like setting them up for indirect heat are also out of the question with the Weber Smokey Joe. The Smokey Joe could easily become a nuisance if you have pets, children or limbs that might accidentally knock the grill over. I usually set my Smokey Joe on a table for easy tending because with the ash catcher I don’t have to worry about it damaging the tabletop, but if you leave it on the ground and forget about it, it could become a booby trap. The Weber Smokey Joe Silver does not come with a lid lock either. If you set it in the trunk of your car unsecured and take off, it could potentially tip and distribute debris everywhere. Weber does offer the Smokey Joe Gold, which has a lid lock. However, the Weber Smokey Joe Gold does not have an ash catcher like the Smokey Joe Silver. All in all, I’m happy with my Weber Smokey Joe Silver. I would recommend it to a friend as long as he or she has realistic expectations for what a grill of this size is capable of. Like I said, its size can be either a strength or a weakness.